Other pages on this website have looked at the early history of Bradford Football Club and its evolution from rugby union to rugby league and finally to association in the late 1800’s and early 1900’s. To complete the story of the birth of Park Avenue, we now turn our attention to the fourth major sport played at the old ground which is of course cricket. Bradford Cricket Club was established in 1836, and the team practiced on land opposite Ashfield Terrace on Great Horton Road, although they played elsewhere on either Fairweather Green or Apperley Bridge. The club had no accommodation on these fields, and cricket equipment was left at a local toll bar. Meetings were held at the “Hope and Anchor” on the corner of Market Place. Bradford’s early games included contests with Horsforth and Guiseley in 1836, and in the following season Keighley, Wakefield and Leeds Oak, amongst others provided opposition. In 1839 the club gained a ground a little above Mannville, which enabled them to play home games and charge admission. The facilities were slightly better than before, consisting of a “rickety old cow-shed, which did duty as a dressing room, warehouse, smoke divan, parlour and kitchen”. That season Bradford took on stronger opposition, and gained victories which acted as a boost to the game in the town. Wider patronage was attracted with manufacturers, merchants and tradesmen joining, and it became necessary to enter into competition with clubs further afield in order to retain the good name already gained. In 1840 two professional bowlers, Antill and Martin were engaged for certain matches. 1841 was an important season for the club, with the appointment of John Hall, a Nottingham man, as professional. Hall remained with Bradford for many years, and appeared for Yorkshire on four occasions between 1844 and 1863. The next step forward came in 1844, when Bradford rather boldly challenged Sheffield Wednesday, one of the country’s leading sides, and were soundly beaten by nine wickets. It was a good experience, however, and in 1847 Bradford came of age, beating Sheffield by 19 runs. From then on Bradford players were held in high esteem and called on for the great Yorkshire matches. 1848 was another significant season as it saw the first appearance of the All England Eleven in the town. Eighteen of Bradford and District took on the visitors and won by 15 wickets, although the inclusion of outsiders such as Letby, Joy and Berry meant that it was not a solely local triumph. The Bradford club was well established by the start of the 1850s and the All England Eleven visited again in 1850 and 1851. However, at the end of the 1851 season the club lost use of its ground, which was sold for house building, and after twelve years the search was on for a new one. This was found on Great Horton Road and was the main ground in the town until the 1870s. The houses of Pemberton Drive now cover the site. 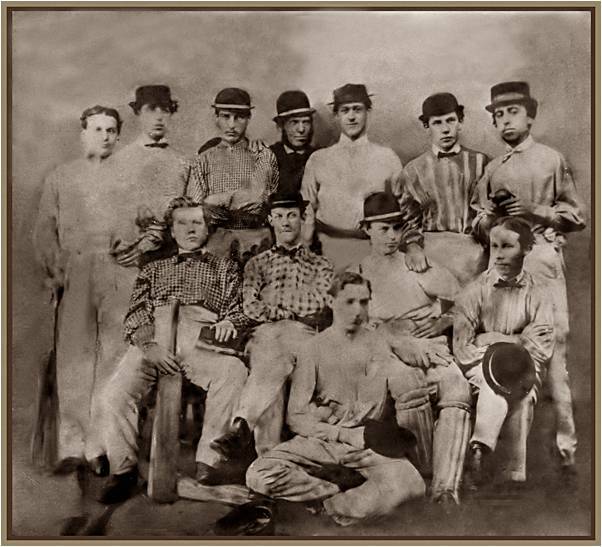 This wonderful picture, unearthed by Graeme Wright, shows the Bradford Cricket Club team of 1860. These were heady days for Bradford cricket. In the early 1850s, with the expansion of the half-day holiday system, there was a big increase in the number of cricket clubs playing on Saturday afternoons. Initially they were associated with particular businesses or warehouses, but gradually clubs were established of the best players in each neighbourhood and over a period of years they became increasingly successful and had an air of permanence about them. Whilst teams like Bradford Albion and Manningham built up reputations, the Old Club as it was known, remained the town’s main cricket club. According to “Lillywhite’s Cricketers’ Companion” they had a “most energetic committee and a liberal subscription list”. Most importantly, the First Eleven was successful, indeed so successful that there was considerable disquiet in 1862 and 1863 about the very small number of games which could be arranged, owing to the lack of willing opponents. In 1863 the situation was so bad that the committee had to arrange games against odds for the “invincible eleven”. In 1863 Bradford arranged a county match against Nottinghamshire, which was well received by players and spectators alike. This was followed by a return visit in 1864, and games with Cambridgeshire in 1865 and 1866. By organizing county matches the Bradford committee was disputing the claims of the committee in Sheffield to dominate Yorkshire cricket, and in November 1863 Bradford backed attempts to organize an alternative county club based in York. Relations with Sheffield were not always amicable, and when the Sheffield committee was in dispute with the five professionals, Bradford did not support Sheffield. The five played in matches arranged at Bradford and in 1866 Bradford hosted all the Yorkshire county games. Unfortunately, the game with Nottinghamshire was a financial disaster, and in 1867 the same visitors refused to visit the town, even for a benefit match for Ike Hodgson. County games at Great Horton Road were discontinued. Indeed only eight first class games were ever staged at the ground. The loss of county cricket in the mid 1860’s was a big blow to Bradford. Nevertheless the committee worked hard to improve the ground, and according to the “Bradford Observer” showed “a praiseworthy desire to provide as good a list of matches as possible.” This included inviting sides such as the United South of England Eleven, as in 1873. Arrangements at Great Horton Road (also known as Easby Road) were improved all the time, so that by the early 1870s there was a brick built covered pavilion with separate divisions for players and spectators, a quoits ground and a bowling green. With such facilities the club grew in size, and it was reported, rather pompously, that “associations of the most friendly character were formed between manufacturers, merchants, tradesmen and working men without a shade of disrespect or overbearing assumption.” In 1873 the old grandstand, which had been a temporary structure was removed and a permanent building put in its place. In November of the same year the Bradford Cricket Club had its AGM. There was an air of confidence, and the committee announced that it intended to do all it could toward getting one, if not two, county matches for the town. Such confidence was soon dashed, however, when in 1875 the club lost its ground and went into a state of suspension. This was not entirely unexpected since other clubs in Bradford had disappeared in the previous two or three years as building work encroached on open spaces and land was cleared for railways and houses in what was at the time one of the fastest growing cities in Europe. Initially the club was able to practice on the field, but could not arrange matches, and instead played eight away. Negotiations were entered into for use of some land near the old ground, but the owner was only prepared to give a ten year lease, and few of the Bradford members and subscribers were prepared to put up money for so short a period of time. Once these talks had collapsed the committee discussed the use of a very suitable piece of land at Lady Royd, but this time, despite having the money, the club was unwilling to pay the £150 per annum rent. The committee recommended that the club be wound up. Shortly after the opening of Park Avenue in 1880, Bradford arranged a game with the Australian touring team, and this turned out to be a great success. Receipts amounted to more than £700, although the Australians insisted on taking 65% as their share. They did, however, pay the club the compliment of praising the new ground, and most of the players paid a guinea to become members. The first season at Park Avenue was a considerable success. Opinion was strongly in favour of the “magnificent new ground”. Attendances were good, and although the cost of the new facilities was high, there was every hope of being able to repay the debts. The club was keen to play host to county matches, and was lucky that J.B. Wostinholm, the Yorkshire county secretary, had been impressed when he attended the opening of the ground. In November he invited Bradford to send representatives to discuss arrangements for the county matches in 1881, and at the meeting in Sheffield those present proceeded to fix the allocation of matches by lottery, with the exception of the game with Nottinghamshire, which the county committee insisted must remain with Sheffield. The other games were distributed by drawing names out of a hat, and Bradford gained Derbyshire and Kent. It was agreed to do the same the next year. Yorkshire’s 1881 home programme began at Huddersfield, but two weeks later the county side appeared at Bradford. Unfortunately, the wicket proved very difficult and Lord Harris called it a “disgrace”. Then, when Derbyshire visited in August, the pitch was so bad that different wickets had to be used for each innings. The field was poorly drained and the soil had not had time to settle. Although Bradford insisted that they had improved the ground, Wostinholm refused to discuss the subject. The Bradford club then accused him of breaking promises made in 1880 to give them two games each season, but this was strongly denied. Eventually Bradford called a meeting of clubs around the county, and a deputation, led by C. Lonsdale of Bradford went to Sheffield to discuss the allocation of matches and committee places. After talks the committee agreed to allow representatives from outside Sheffield to sit on the county executive. Bradford was included for the first time, and so had a voice in the running of Yorkshire cricket. In 1883 Bradford Park Avenue was restored as a county venue, and continued to be so for more than one hundred years. This rare photograph shows Park Avenue cricket ground as it was in the 1890’s, with the old stand backing on to the rugby field. The fixture was the Yorkshire vs Lancashire Roses game played on the 6th, 7th and 8th August 1894 at the start of Bowling tide week, when all the mills in the town closed down. The game was designated as a benefit match for Yorkshire and England left-arm spinner Bobby Peel who must have been delighted with the attendance. Yorkshire won by 117 runs. The picture was published in “Famous Cricketers and Cricket Grounds 1895”.